The fourth and final Russo-Turkish war of the nineteenth century (1877-1878) ended with a humiliating defeat for the Ottoman Empire and the signature of the Treaty of San Stefano on March 3, 1878. By this treaty, the Russian Empire tried to settle the Eastern Question and alter the balance of power in the Balkan Peninsula to its own advantage. Article 16 of the treaty established: “As the evacuation by the Russian troops of the territory which they occupy in Armenia, and which is to be restored to Turkey, might give rise to conflicts and complications detrimental to the maintenance of good relations between the two countries, the Sublime Porte engages to carry into effect, without further delay, the improvements and reforms demanded by local requirements in the provinces inhabited by Armenians, and to guarantee their security from Kurds and Circassians.” This meant that the Ottoman Empire agreed to carry reforms in Armenia under the immediate supervision of Russian troops before their evacuation. The Armenian delegation returned with empty hands to Constantinople. Upon his return, Khrimian Hayrig pronounced his famous homily of the Iron Ladle, in which he stated that each power at Berlin had taken a share of the contents of a great soup bowl with an iron ladle, whereas he had only a “paper ladle” (a petition) and thus could bring nothing back to the Armenian people. His sermon marked a turning point in Armenian political consciousness. The Russo-Turkish war and the Treaty of Berlin marked the internationalization of the Armenian Question. For the next four decades, until the outbreak of World War I, Armenians would claim from the European powers that they forced Turkey to execute the promised reforms. The Turkish government would carry a policy of violence until the ultimate level: genocide. This Sunday, September 25, is the Feast of the Holy Cross of Varak, a feast that is unique to the Armenian Church. The Hripsimiantz Virgins, after coming to Armenia, lived near Mount Varak. Hripsime always carried a small wooden cross believed to have been made from a piece of the true cross. One day, in order to escape persecution, she sought refuge on the mountain where she hid the cross among the rocks before fleeing to Vagharshabad. According to tradition, in the year 653, a hermit named Totig found Hripsime’s hidden cross. He followed a brilliant light that illuminated the mountain and guided him inside the church to the altar where he found the cross. The light shone for twelve days. 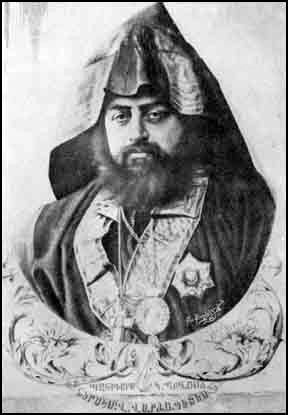 In memory of this event, Catholicos Nerses established the Feast of the Holy Cross of Varak. He also wrote the beautiful hymn, "By the Sign of Your All Powerful Holy Cross," (Nshanav Amenahaght Khatchit). The Monastry of St. Nishan was built on Mount Varak, which is in the southeastern region of Van. In later years the Monastery became prominent when Khrimian Hayrik established a printing house and a school there hoping to make the monastery an educational center. The massacres and deportations of 1915 destroyed those plans, as well as so much more. "To you, O Christ, who bestowed on it universal Church, this victorious, precious sign received by God, we always send up praise in the highest. This cross by your will, O Christ, and by the power of the Almighty Holy Spirit lifted up by the assemblies of angels is seen resting on Mount Varak. Come, you people, bow down in worship before the divine holy sign; lift up your hands in holiness with one accord and always glorify him who lives on it."